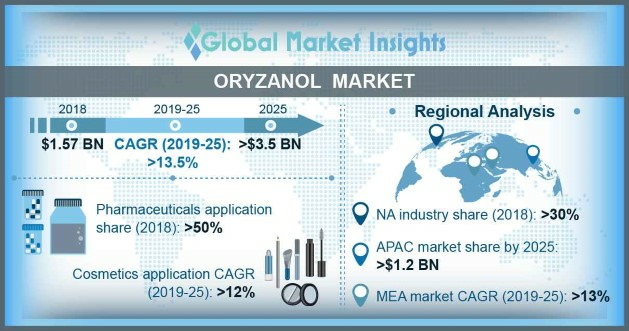 Oryzanol Market size is estimated to exceed USD 3.5 billion by 2025; according to a new research report by Global Market Insights, Inc. Rising health concerns among young and geriatric population along with increasing awareness regarding LDL cholesterol will drive the oryzanol market growth. Increasing heart related problems due to unhealthy eating habits have propagated the demand for cholesterol control medicines. As per WHO, each year approximately 2.6 million deaths are caused due to raised cholesterol level. North America and Europe are the two major regions having the highest share of population witnessing high cholesterol disorder. Health awareness programs and high affordability are among the key factors to elevate oryzanol consumption in these two regions. Shifting trends toward healthier lifestyle among young population has positively influenced the consumption of sport supplements. Oryzanol is a recommended and widely acceptable ingredient in sport nutrition for its body building aid. Changing purchasing habits of youth to focus more on physique and appearance are the prime reason for these supplements demand. Increasing government focus to expand the oryzanol production due to its highly beneficial properties and currently underutilized production capacity will fuel the industry production expansion. The industry will witness downward price trend owing to increasing extraction process which will result into more product availability and high competition in the oryzanol market. Pharmaceutical applications accounted for 50% of the global demand in 2018. Unhealthy eating habits along with lack of physical activity has resulted into bad cholesterol which in turns creating demand for oryzanol medicines. It is an ingredient extracted from rice bran which helps in controlling the fat level in the body. Other usage in the pharmaceutical sector is the relief from menopause symptoms. Oryzanol market nutraceuticals & sport supplements application is set to observe over 14% CAGR up to 2025. Rising fitness trends along with increasing consumer spending on self-development products with respect to appearance has stimulated the oryzanol based sport supplements demand. No health side effects if taken as per the prescribed dosage along with other benefits such as healthy heart and controlled hyperlipidemia encourages the product consumption. In cosmetic applications, the ingredient is highly beneficial in the production of anti-aging and sunscreen products due to its high antioxidant properties. In 2018, North America witnessed over 30% of the global oryzanol consumption. High ratio of population suffering from raised cholesterol along with increasing consumer spending on nutraceuticals will enhance the regional industry growth. Government efforts to raise the health awareness campaigns will induce the market growth. Asia Pacific oryzanol market will witness 15% CAGR up to 2025. Japan was the foremost country to execute the extraction of oryzanol from rice bran oil. The region is responsible for highest number of innovations in this industry. Large raw material availability along with successful track of product development are the key reasons for industry growth in this region. Rising per capita income along with increasing ratio of younger population will foster the regional industry growth. The global oryzanol market share is consolidated and focused in Asia Pacific region. TSUNO, Oryza Oil & Fat Chemical, Okayasu, Delekang Food, Henry Lamotte Oils, Kangcare, and Jining Ankang Pharmaceuticals are among the key industry players. Predictions pertaining to production capacity expansion and entrance of new industry players due to large availability of resources will impact the market share during the forecast period.